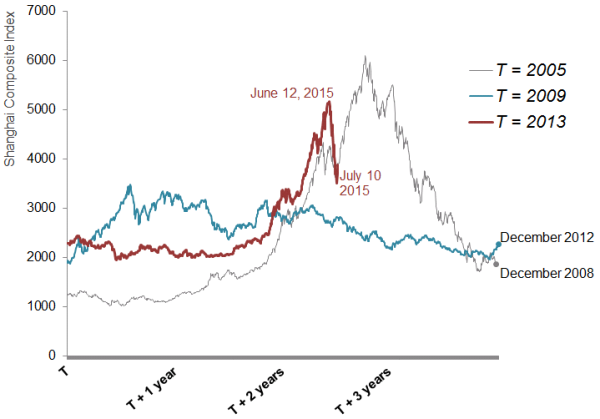 Would Grexit or China’s stock market gyrations have had larger impact on the global economy? No one will now know for sure, although conjectures had certainly been offered to suggest that, as well as to hypothesise profound longer-term damage to China’s economy itself (The Economist 03 July 2015; The Diplomat 06 July 2015; Bloomberg View 29 June 2015). On another front, a different narrative has also emerged on how the sharp 30% decline of early July signalled something deeper and more insidious going on with China politically (Drezner 07 July 2015 Washington Post; headlines WSJ). Crises more likely come from an unusual movement in economic indicators than from nothing in particular. China’s economy has done so many things successfully against mainstream prediction that few observers can credit its continued (mostly) exceptional performance. Is this time finally different? 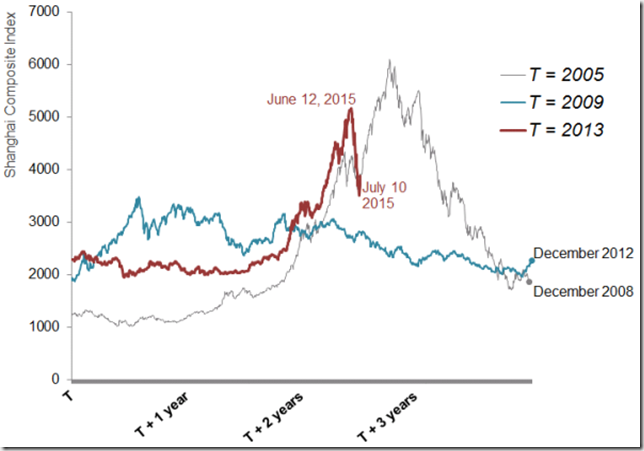 First, the blue line indicates the Shanghai market experiencing a four-year 2009-2012 period of relative stability. Calm is not impossible. Next, the grey line shows the four-year period 2005-2008, reflecting first the more general worldwide bull market and then the sharp crash of the 2008 Global Financial Crisis: No exceptionalism and triumphalism for China here. Without the extenuating circumstances like a global economy on the edge, don’t look to China’s stock market to signal anything useful about the real Chinese economy. In the US and in most advanced Western economies, half the population directly hold equities; corporations finance operations through funds raised in stockmarkets; pension funds, mutual funds, and other components of consumer wealth hold broad-based asset portfolios and thuse keenly feel Wall Street’s fluctuations. As a result a perceived sustained decline in stockmarkets has individual investors cutting back consumption and businesses lowering spending to build productive capacity. Economics even has the entire Q theory of investment organised around this idea. A sharp fall in asset prices can therefore have sharp recessionary consequences. In China, by contrast, (and across huge swathes of Asia more generally) individuals favour bank deposits on the one hand, and property and real estate on the other. Less than 5% of China’s corporate warchest derive from equity financing. Even among urban Chinese, fewer than 7% hold equities directly, although of course those that do so turn out to have large quantities invested. As for the larger concerns on how this policy reaction reflects a turn-around in China’s reforms, and thus a wavering of confidence, Arthur Kroeber again usefully reminds us, “The Third Plenum Decision is no Thatcherite free-market manifesto.” Remember, the same time that Xi Jinping and China’s Standing Committee in 2013 talked up a decisive role for market forces, the language in the text also reserved a dominant role for the state sector. China’s policy reaction to the stockmarket decline might not, in retrospect, have been the wisest of steps, but one couldn’t sensibly argue it was a dramatic pullback from official policy. Quite the opposite. China’s has always been an approach of pragmatic opportunism. This is not to say that dangers don’t lie ahead for China’s continuing economic transformation, nor that everything is currently healthy and balanced in the world’s second largest economy. China remains a developing nation faced with massive challenges. And, beyond that, China realises that all advanced economies eventually come to rely on their stockmarkets to power economic growth and that these economies learn to live with that market’s vicissitudes. As long ago as 1966 Paul Samuelson had famously quipped that Wall Street predicted 9 of the last five recessions in the US. China will have to resign itself to that kind of behaviour too, or come up with some alternative formula for finance and economic performance. But all in all, this most recent China stockmarket experience is just a fluctuation that, both in its wider implications and in the cold light of recent historical experience, registers to be far from dramatic.